LYM | What Does LYM Mean? LYM means "Love You More". The abbreviation LYM is a shortened form of the sentence "I Love You More". It is commonly used as a response to a declaration of love and is a way of saying that, no matter how much they love you, your love for them is greater. 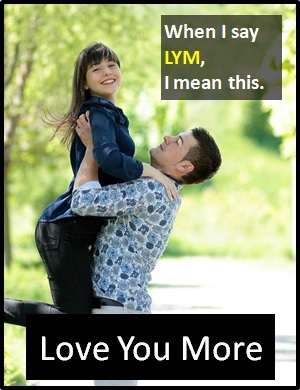 LYM has the same meaning as the abbreviation ILUM ("I Love You More"). Boy band JLS released a song entitled "Love You More", which was used as the official Children In Need song in 2010. The single debuted at number one on the UK Singles Chart in November of that year and was the band's fourth UK number-one single. No matter how much you love me, I LYM. Nigel: See you tonight. Love you. David: I love you so, so much. Sophie: However much that is, I LYM. LYM is an abbreviation of the sentence "I love you more". It is normally used as a standalone declarative sentence (i.e., a statement). In other words, it is not often used as another part of speech within a wider sentence. Before the digital era, we might have just said "I love you more" instead of using LYM.